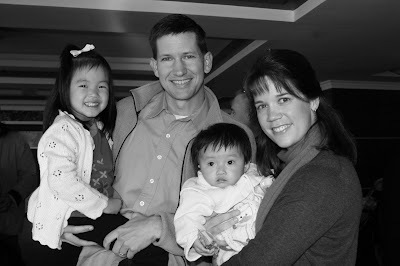 In June 2005, my husband and I stood in a Chinese office building as our healthy baby girl was placed in our arms. We had waited for this moment for 11 years and could not believe how blessed we were to have experienced this miracle of adoption. A year later, our dossier was headed back to China in hopes of adding a second child to our family. Over the next two years, the wait for a referral from China increased dramatically. A yearlong military deployment and two household moves kept us from changing our course. We took a wait and see attitude while continuing to explore other adoption programs that we could pursue concurrently or in place of China. In doing so, we found our hearts opening to many different children. Although we’d written it off for many years, we finally began investigating China’s Waiting Child (WC) program. We still had reservations when we submitted our application after two years on the non-special needs list. I don’t have a nursing bone in my body and faint at the sight of blood, so I figured there was no way I could adequately care for a special needs child. For me personally, I had to have very clear reasons for choosing to adopt a child with special needs. When we switched to the WC program (June 2008), we were concerned that it would be impossible to discern who our child should be. 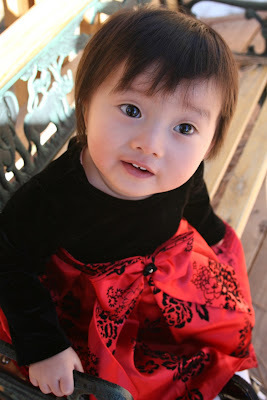 When we adopted our first daughter, China had done the matching. We felt this was a very “divine” way to choose a child since it was out of our hands and therefore entirely in God’s hands. The WC program required us to choose a child. We didn’t want our fears and anxieties to influence this lifelong decision. Thankfully, we have a sovereign God that brought our child to us at just the right time despite our concerns. A month later, in the quiet of the early morning, the call came from our agency. 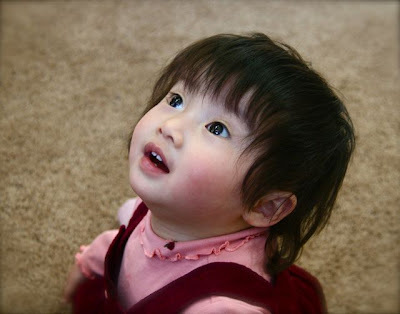 Side by side, my husband and I reviewed the file of an 8-month-old baby girl named Mei Ying waiting in foster care in Jiangxi province. Her special need was listed as unilateral microtia / aural atresia with a possible diagnosis of Hepatitis B. Put simply, she has a “tiny ear” on the right side and lacks an external ear canal opening. We had first learned about microtia while filling out our agency’s special needs application. Further research online made us confident this was a condition we could readily accept. We accepted her file and three months later, we held our daughter Lydia Mei Ying for the first time! In addition to the regular post-adoption checkups, we met with an audiologist. He looked at the ABRtest results from China we had received with her referral. The way he described it to me in layman’s terms is that her hearing loss in her right ear is about equal to sticking your finger in your ear. Lydia will have a CT scan to show us the structure of her middle and inner ear. She’ll also have a full hearing test. But all of this is just informing us of how her ear developed (or didn’t). There is nothing we need to do or undo for a long time. We were especially glad to learn that she would not need surgery any time soon. Microtia repair is a surgery that is considered cosmetic by insurance companies and also debated among doctors. Many times, parents choose to wait until the child can be part of the decision process for surgery. It’s easy to do an Internet search on microtia. There is also a Yahoo! group on the subject. Lydia is in all respects a healthy baby girl. She tested negative for Hepatitis B! She also tested as being completely immune to the disease. 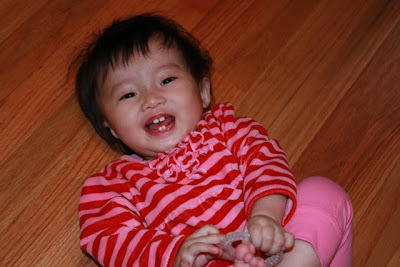 Her “uncertain” diagnosis in China may have been caused by an infection at birth or by the vaccination given in China. Our research into Hepatitis B showed us that it’s a very manageable disease that does not put our family members or our community at risk. We would gladly adopt another child with confirmed or “uncertain” diagnosis of Hepatitis B. At age 14 months, Lydia has learned to crawl and now walks across the room in that adorable baby Frankenstein way. The occupational and physical therapists are both impressed at how quickly she is catching up. She is very active and curious to the new world we’ve given her. Everyone agrees that in 3-6 months, she won’t have any developmental delays! We may still have issues with speech development in the future, but for now, she is plenty vocal for her age. She has names for each family member and loves music. The audiologist assured me that she is not deaf and that she can “hear a truck coming.” I mentioned to him that she can also hear a bottle being shaken from across the room! If you are considering adoption of a special needs child, remember that it is not their diagnosis that defines them. It is God who made them and their special need is no secret to Him. Lydia has only been home for three months and we have no guarantee of what lies ahead for her. Even our oldest daughter, adopted from China’s regular track, could have medical needs arise in the future. Any adoption has risks just as pregnancy does. However, we proceed forward trusting in God’s strength to equip us as their parents. We have taken a leap of faith with special needs, but now seeing the child God planned to be ours, I wonder if He only wanted a bunny hop from us. Yet, we had to be willing to jump all the way. Although I sometimes have worries, I can honestly say that I am so confident in the God who sustains me. Parenting and adoption are ways that we can glorify God because we know for certain there is no way we can do it on our own strength. We were invited to experience the adoption road with all its potholes and unexpected turns. It was on this road we discovered God’s heart for adoption. Learn more about our adoption road at our website.